When you were making your college dorm checklist, you probably didn't think of shower sandals. You may have never even heard of them, but they are a dorm essential that you cannot go to college without. So what are shower shoes, you are are wondering? Shower shoes for college are antimicrobial, anti-slip shower flip flops that protect your feet and keep them off the bathroom floor. There may be 30 or more college students using the same bathroom as you- you don't want to walk through the bathroom or shower without shower flip flops on your feet. You may think you could just wear regular flip flops in the shower, but you really can't do that and that's because regular flip flops don't have the traction you need to keep from slipping. 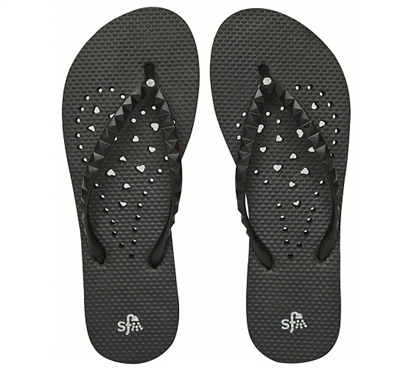 Our Showaflops Women's Antimicrobial Shower Sandal are specially made to be worn in the shower so they have a textured pebble surface and deep diamond grooves to grip your foot and the floor and help prevent you from slipping on a soapy surface. There are also drainage holes in our Showaflops so that the water can leak out of your shower sandals. The drainage holes in these Showaflops are actually hearts punched out in a heart shaped pattern and there is even a rhinestone on each shower flip flop so that your shower shoes are not only functional but stylish as well! Our Showaflops are also great to wear to the college pool or even to the beach, too!